Every time that it is announced that the Microsoft Corporation is coming out with a new version of its flagship operating system, Windows, people become intrigued. This is because Windows has been the primary personal computer operating system for most computer users around the world. Sure, Apple may give them a run for the money, but when all is said and done, Windows is still head and shoulders above the rest of the competition. The newest incarnation of the operating system is Windows 8, and it is slated to be released by the end of 2012, probably just in time for the Christmas season. Currently, there are some test versions and beta versions of Windows 8 out there somewhere, and the reviews have been largely positive, for the most part. With the booming popularity of apps, it is no surprise that the Windows 8 operating system will rely heavily on the apps. It will likely offer exclusive apps to the Windows 8 users only, and they will probably resemble the ones used with Google, Apple and Android products. But, for the most part Windows 8 will be very similar to Windows 7, which was the best version Microsoft has put out to date. Microsoft has done a lot to hide what the actual desktop will look like when it comes to the finalized version of Windows 8. The reason they have kept it hidden is because it is probably what most computer users, and Windows fans, are looking forward to. The general consensus is that the new desktop will look sharper, more modern and overall just plain cleaner. This is going to be the biggest change in the operating system. 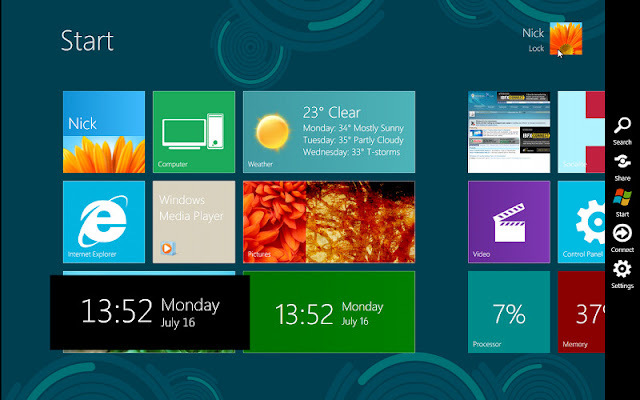 There will be dozens, if not hundreds of apps available on Windows 8. These apps are going to be the biggest selling point when it comes to people switching over to Windows 8, rather than their other option. Paul is a freelance writer for many web sites, blogs and print publications, among other outlets. He is a technology writer, but occasionally stretches out into the realms of home safety and a little on his home security system.